“Finish for a Guinness” with me! Please join me! Sunday, August 31 at 10 a.m. in Warren, Rhode Island! I will cross the finish line and drink one for my ALS community. Hope to see you there. This entry was posted in Uncategorized on August 17, 2014 by Elizabeth Palko. A minute and a half video of dad and I is all of a sudden plastered all over the internet. At first we were excited about getting 100 likes on Facebook and having people call us out in their videos, then a few days later dad bursts into tears because he sees his face and his message on the Huffington Post. The ice bucket challenge is social media activism reaching unprecedented levels, and I’m witnessing it all first hand. Not only are ALS organizations across the nation receiving massive increases in donations, but the Palko family is as well. Complete and total strangers are reaching into their pockets to help out a family they don’t even know. Strangers are reading this right now because of the amazing power of social media. In the past week my inbox has been flooded with hundreds of messages from people who saw the video and had something nice to say, some information to share, a story to tell. About 100 of those messages came from people whose lives are directly affected by ALS. Dozens of those are sons and daughters of parents who are suffering from ALS or who have already passed from it. Before all of this social media madness, I didn’t know anybody else in my shoes. I have amazing support and incredible friends, but nobody quite understood what it’s like to be experiencing this. And now, thanks to our video going viral, I’ve been in touch with other people who know exactly what I feel like. They know how hard it is to leave home and go to college when your parents are home suffering. They gave me a hint to call my dad’s cell phone and let it ring through to his voicemail so I hear the message he recorded a few years ago and remember what his voice used to sound like. They have stories about their dads running wheelchairs into walls. I feel less alone. Now what would the internet be without comments of criticism? To those suffering from drought on the west coast, I sincerely wish I could give you all the water that’s been pouring down on the east coast. I wish all of these buckets dumped over people’s heads could be dumped over your gardens, farms, and rivers. Maybe we can start dumping buckets of sand over our heads to raise awareness and demand action for drought and climate change. My entire academic life is devoted to environmental studies, so I would be thrilled if the next big social media campaign targets these drastic problems. For those who are annoyed with the ice bucket challenge taking up your news feed and for those who think this really isn’t doing anything, I first want you ask you if you knew about ALS before this happened. If you did, great! If you didn’t, well now you do! This disease is receiving more attention than it’s ever gotten. ALS organizations across the nation have received millions of dollars over the past couple days. Those donations will be channeled into research that will hopefully figure out this disease. Because right now there is almost nothing known about ALS. We don’t know how it’s caused, we don’t know how to treat it, and we sure as hell don’t have a cure. This matters because maybe one day you or your father or mother or the love of your life will be diagnosed with ALS. It will be the most terrifying diagnosis you ever receive. Because your life might end up looking like this. Because you will learn that you have about 2-5 years to live. You will see your hands stop working, your legs stop walking, your voice stop talking, your breathing disappearing. But your brain will still function perfectly and it will have to process how insanely debilitating and depressing it is to watch your body slowly turn to mush while your loved ones surround you in confusion and sadness. Here in the Palko house we have good days and bad days, just like everybody else. We laugh when the dogs jump up on dad’s wheelchair, drink good beer, and watch Jimmy Fallon. But sometimes we have really, really bad days. My mom’s birthday was earlier this week. When she left to go on an hour walk with her friend, the first time she’s been able to leave the house and do something for herself, dad and I were alone to decorate and prepare her birthday dinner. As I scurried around the house trying to get everything in order, I stepped into dad’s room to find him quietly crying. I ask what’s wrong and he says he just wants to help. He begins to sob, I begin to sob. We laugh at each other crying and then cry some more. He just wants to set the table, to hang some streamers, to sign her birthday card and buy a gift for my mother. My incredibly strong, amazing mother, who works tirelessly to make sure we keep a roof over our heads and wheelchair ramps under our feet. Who serves as dad’s arms and legs. Who gets up 3 times every single night to go downstairs to check on him, flip him over in bed, adjust his covers. Who drives him multiple times a week to Boston so he can work with physical therapists and blow doctors away by walking more than they expect. My mother is the most under-recognized person in all of this, and we would be nothing without her. Everybody is just trying to survive on this planet. And while life is hard and overwhelming, we survive. Because the human spirit is strong and triumphs adversity. There is tremendous good in the world. I’m seeing it right now. Friends, family, and complete strangers are reaching out to show they care. I wake up to messages of people saying how inspired they are to help, how they donated despite having almost no money in their bank accounts, how they offer words of comfort and solidarity in a struggle that once seemed impossibly tough, now seems possible. I find strength and courage and hope in these people’s words. They encourage my family and me to be brave and set an example others facing challenge. Good acts propel this world forward; whether it’s saying one nice thing to somebody who needs to hear it, volunteering, protesting for a cause you believe in, being a friend to someone with depression, or donating money to help fight ALS or any other cause that’s important to you. People are always looking for stories that ‘restore their faith in humanity’. How about doing something every day so that your faith in humanity is constant and doesn’t need restoring. Live compassionately, and in the words of one of my heroes Neil deGrasse Tyson, lessen the suffering of others. Whatever you do to help another person survive on this crazy planet is doing good for not only them, but for you too. The ice bucket challenge will probably die down soon, but our fight with ALS is just beginning. Now that so many people are more aware of ALS and these organizations have some money, maybe we can start some groundbreaking studies to help find a cure. The progression of science and the medical world have accomplished incredible feats. We’ve eradicated deadly diseases, prevented viruses, treated cancers, cured illnesses. Now it’s ALS’s turn. Let’s turn this terminal illness into a treatable one. I hope more than anything that dad’s 8 million stem cells kick in and the next video to go viral is of him skiing or surfing again. Or of Pete Frates tossing a baseball to his expected child, or Steve Gleason throwing a football back in the stadium where he belongs. I hope it’s a video of a person dying of ALS all of a sudden able use their arms again to hug their families and use their own voice instead of a computer’s to say I love you. When that video comes out, you will look back and remember why the ice bucket challenge mattered. This entry was posted in Uncategorized on August 14, 2014 by Gabby Palko. It’s all over the news. Politicians are doing it, the Dropkick Murphys are doing it, the Boston Bruins are doing it, the Patriots are doing it…. Thanks to Pete Frates and Team Frate Train, ALS awareness is blowing up over social media. 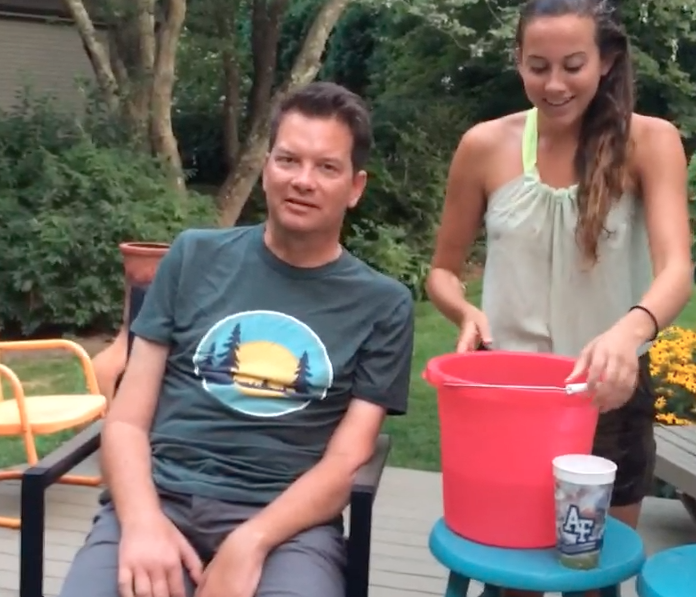 Every time I see a new video I thrust my phone in dad’s face to show him one more person giving a shoutout to ALS. For those of you who may not be familiar, there is a challenge going around on Facebook where people are dumping buckets of ice water on themselves and calling out three friends to do the same, all in the name of charity. Team Frate Train immediately scooped up the challenge and began sharing the word about ALS. And awareness matters. The ALS Association and other ALS organizations have seen unprecedented increases in donations ever since the ice bucket challenge started. Those donations help affected families and fund research. No one knows what causes ALS, and there is no known cure. The average life expectancy after diagnoses is 2-5 years. We need research. So mom dad and I have watched several friends, family members, and celebrities dump buckets of ice water on their heads, and we started to feel a little left out. With a self nomination and two buckets of water, the ALS ice bucket challenge was brought to a whole new level when the badass ALS patient himself was drenched in ice water. You can watch the video here. Initially, I offered to just dump the bucket on myself and let dad do all the talking. However, he immediately insisted he be included in the challenge, because he’s “not weak”. Nope, he certainly is not. Although ALS is robbing his body and his voice, it’s certainly not ruining his ability to have fun. Keep the awareness and the buckets flowing! This entry was posted in Uncategorized on August 6, 2014 by Gabby Palko.